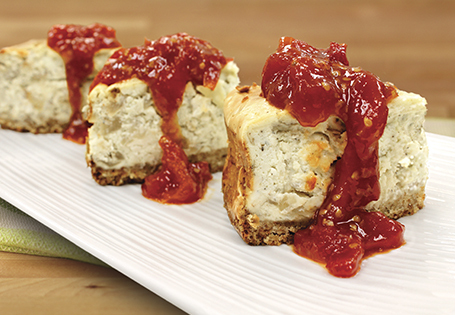 A savory caramelized apple, onion and blue cheese cheesecake topped with a cherry tomato jam. Best served with crackers. In a large sauté pan, heat oil over medium heat. Add the onions, cook for 10-15 minutes until caramelized, stirring occasionally. Add the apples and continue cooking until tender, about 5 minutes. Season to taste with salt and pepper. Reserve. Using an electric mixer, cream the cream cheese and blue cheese. Slowly add the eggs until well combined. Add the 1 teaspoon salt and 1 teaspoon pepper. Stir in the onion mixture. In a medium bowl, combine the butter, bread crumbs, parmesan cheese, remaining ½ teaspoon salt and ½ teaspoon pepper. Stir until well combined. Press into the bottom of a 9-inch round cake pan. Bake for 7 minutes. Remove crust from oven, coat the sides of the pan with cooking spray. Stir cheesecake batter and pour into the pan. Bake for 40 minutes. Cover with foil and bake for 15 minutes or until center is set. Turn off the oven, open the door slightly and allow to rest for 15 minutes. Remove from oven. Chill for 4 hours or overnight. In a medium saucepan, heat the lemon zest and juice over high heat. Add the sugar, stir until dissolved. Add the tomatoes. Bring to a boil, stir occasionally for 10 minutes until the tomatoes break down and the sauce thickens. Season to taste with salt. Serve on top of the cheesecake. TIP: If the pan becomes too dry in step 2, add a tablespoon of water, deglaze and cook until the water has evaporated. Cheesecake can be made ahead and frozen for up to 2 months, just remove the night before a party and thaw in the refrigerator!